Information we collect: We collect information to process orders, personalize your shopping experience and to keep you informed about Boomerang products and services. Here are the types of information we gather. We receive and store any information you enter on our website or give us in any other way. For example, when you place an order or book a session you may be asked to provide your name, mailing and billing addresses, phone numbers, email address, and credit card or payment information. We receive and store certain types of information through your interactions with us. We and our partners may also collect information via frequently used information-tracking tools, such as cookies. Examples of the information we may collect and analyze through cookies include your browser type, Internet protocol (IP) address, geographic location, purchase history, login, email address and search history. We may also use software tools to track and examine session information, including page interaction information (such as page views, clicks, and scrolling), length of visit, page response times, and device-specific information (such as hardware model, operating system version, unique device identifiers, and mobile network information including phone number). How we use information we collect: We use the information we collect to provide a secure, efficient and tailored user experience and to improve the overall quality of our services. For example, we may use your information to personalize your shopping experience to make better recommendations about the products and services that might be of interest to you. Non-personally identifiable data may be aggregated to better understand how visitors use our site, and to help manage, maintain, and report on use of our website. How we protect your personal information: We are committed to protecting the security of your personal information. We employ reasonable technical, administrative and physical safeguards to protect the confidentiality of your personal information, employing industry-recognized technical safeguards, such as encryption and firewalls, and have adopted and implemented security procedures to protect your information from loss, misuse or unauthorized alteration. Notwithstanding our efforts, we cannot guarantee absolute or unqualified protection of this information given the open nature and resulting instability of the Internet. Furthermore, the personal information we collect is protected against unauthorized access. With your consent, we may provide your information to affiliates or vendors to fulfill our responsibilities including, but not limited to, delivering a product or service that you order. Any information you provide directly to a third party merchant, website or application is not covered by this privacy notice. We are not responsible for the privacy or security practices of merchants or other third parties with whom you choose to share your personal information directly. We encourage you to review the privacy policies of any third party to whom you choose to share your personal information directly. You may choose to submit a product review online, via email or over social. If you post a review, we will ask for your name or nickname, email address, and geographic location. If you submit a review, your name or nickname, and geographic location will be visible to other users (your email address will be kept private). 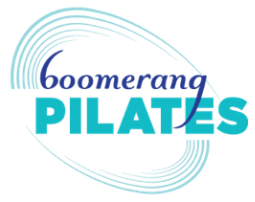 Any personally identifiable information you provide as part of a submitted review can be read or used by other visitors to boomerangpilates.ca. We are not responsible for any personally identifiable information that you provide as part of your review. We may provide your information to affiliates or partners such as training centers who may use a bonded mailing house or Boomerang’s email service to send you information about training and certification programs and workshops to be held in your geographic area. At all times, we reserve the right to disclose any information, including personally identifiable information, to comply with any applicable law, regulation, legal process or governmental request; to protect Boomerang’s rights or property, or during emergencies when safety is at risk, or for credit fraud protection and risk reduction purposes. Opt-out: At any time, you may opt-out of marketing email communications by sending your email address to info@boomerangpilates.ca. Please allow up to 10 days to process your request. Please note, even if you choose to not receive marketing communications you may still receive transactional email messages regarding your account (e.g. receipts, order confirmation, customer service notifications, certificates, session reminders, etc.). Cookies and anonymous identifiers: We and our partners use various technologies to collect and store information as you navigate our website. This may include sending one or more cookies, pixel tags or anonymous identifiers to your device. These technologies enable us to provide features such as quick and convenient shopping and to store items in your shopping cart between visits to our website. Third-party content, links and plugins: This site contains content links to third-party websites. Please be aware that we are not responsible for the privacy practices of those, or any other, sites. If you have questions about how those websites collect and use data, you should carefully read those sites’ privacy policies. Children: This website is intended for adults. We do not knowingly collect personal information from children under the age of 13. However, if the parent or guardian of a child under 13 believes that the child has provided us with personally identifiable information, the parent or guardian of that child should contact us at info@boomerangpilates.ca to have this information deleted from our files. If we become aware that a child under 13 has provided us with personal information, we will delete such information from our files.